I have been so excited to do this review ever since the publicist contacted me asking if I would be interested in doing it. I have had the book a month now and FINALLY I am sitting down to tell you about it. You see it took time to write this because like a good box of chocolates… I took my time reading this book and truly enjoyed each and every bite of it, wanting to make the delicious words last forever. I knew Don’t Sweat the Small Stuff for Moms was going to be good, but folks this book should be a must read for every mom! Seriously! I am talking as soon as you see the little blue line on the stick or sign the adoption papers they should hand you this book kind of GOOD! The book reads as if a friend is talking to you, reminding you of things you may already know, offering new perspectives, fresh ideas and encouraging you to perhaps even make a few small changes. And this Friend really gets us. And when I say US, I mean special needs moms. Don’t believe me, read Chapter 4 Empowered “Mom” page 15. 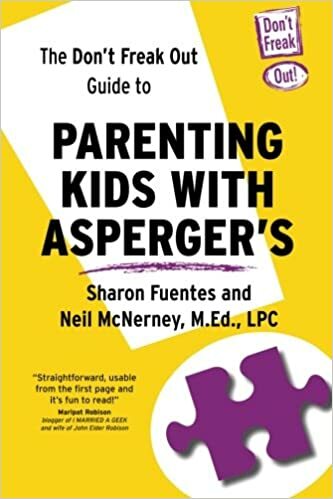 “If you have a child with a learning, emotional, or developmental disability, you are the ship that cannot sink, because your child is the passenger. If you cannot rally to the job, there isn’t anyone who will.” Then she goes on to say, ” … you must have the courage of a warrior and the persistence of a bull.” See she gets it! She sees us folks and gets us. She may not be a member of our club… but she gets it! I could go on and on and on but instead I invite you to get the book yourself and take your time and dive into this delicious box of chocolate! You can purchase the book HERE or HERE... OR you can enter to win your very own copy! Yes folks it’s giveaway time. Here are the rules. To have a chance to win your very own copy of Kristine Carlson’s Don’t Sweat the Small Stuff for Moms book, simple leave a comment here with the best advice you have ever gotten about being a mom! Just think of all the great stuff we will learn from another! Oh I get chills just thinking about. My son is autistic ~ One of the most amazing words of advise was ~ “Grieve that “perfect child” you expected to have. Go thru all of the emotions that come with that grief. But in the end ~ Don’t try to change him!” ~ Not so easy on this journey!~ But I listened. My son is my world, and he sure does have lots of fun in HIS world! I loved all of the “Don’t Sweat the…” books I have read, and look forward to reading this one. With constant repetition, the small stuff can seem big, so it’s good to have a reminder to keep a healthy perspective. Thank you for bringing this book to my attention. My best advice was from my pediatrician whom has since retired and we loved. He told me to go home and “hug my child” and that everything will work itself out. after we found out his Autism diagnosis. I am grateful because I had not known that soon after he would not allow us to touch him any longer. Best advice was to enjoy “this time” with my kid(s) because it goes by way so fast. sure does…these past five years as a mom have absolutely flown! the best advice I ever got was that work will always be there, your kids will not. So always choose your kids first! My best advice comes from my mom. My oldest has severe autism, and I lean on my mom heavily at times for emotional support. She always tells me that I have more strength than I realize, and that I CAN do this. Sometimes it is all I need to hear. The best advice I have ever received as a mom is “treat every day as your last cause you never know what tomorrow brings ” . I also of course already like mama’s turn now on Facebook nd just liked don’t sweat the small stuff thank you for the opportunity to enter to win. Best advice i got was trust your gut instinct. My son is 6 and was finally diagnosed last year with Autism, ADHD, anxiety disorder, and mood disorder. I am still trying to figure out how to not sweat the small things! I think this book might be helpful for me as this has been a long road and we still have a long road ahead of us! After my daughter’s autism diagnosis, I received the following advice : ‘Go ahead and grieve for a bit, but then get on with it and take care of her’…it was wonderful, if I wouldn’t have given myself permission to grieve I would have never been able to move forward. I dont think ive ever been given “mom advice” I tell my kids not to be afraid to make mistakes, this is how we learn. My life was probably not how my mom would have planned for me, I took the path less travelled with lots of learning curves along the way. But this is what has made me the mom/person I am today. If I had to do it all over again, I wouldn’t change a thing. Our home isn’t perfect, there’s toys etc strewn all over but as my gramma used to say if you have a choice to do housework or a chance to get outside and play, enjoy the sunshine! Be open to what our children are teaching. It will clarify and justify every ounce of intuition. Think about it. Any times when you denied your gut feeling and was glad you had done so? Officially on Tweet now…….. following you and Lori. I feel like a stalker, lol!